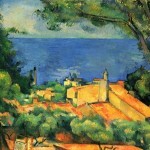 Paul Cézanne was born in 1839 at Aix in Provence France. His stern father was a successful hat dealer and exporter who co-founded a banking firm. 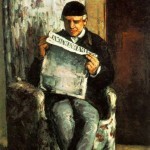 Cezanne, while attending the College Bourbon, was friends with Émile François Zola (1840-1902). The friends shared a love of literature and developed a friendly rivalry in prose and poetic compositions. Due to his mother’s strong influence, his father begrudgingly offered the young artist a monthly allowance of 125 francs a month (about $25 American dollars). But, that amount was cut in half when his father discovered Paul had a child with his mistress Hortense Fiquet without benefit of marriage. Paul borrowed money from Zola to keep food on the table for his mistress and son. A year later his mother intervened and the allowance was restored. 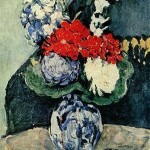 Cezanne legally married the mother of his child to placate everyone. 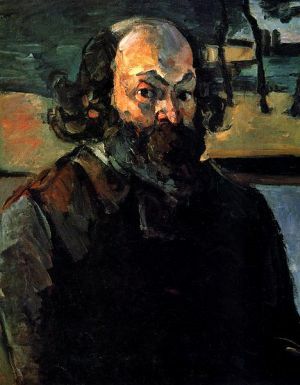 Upon his father’s death several years later, Cezanne, who had always hated his father, deemed him a genius particularly in light of the large inheritance the artist received. His marriage was an unhappy one. She preferred Switzerland and lemonade; he hated Switzerland and preferred France. He saw her infrequently and that was often only to use her as a model for his paintings as she was able to sit still and keep her mouth shut. Cezanne was fond of his son and admitted that “The boy is smarter than I am, I have no practical sense.” Paul Jr. would assume the responsibility of managing his father’s business and serve as his agent. 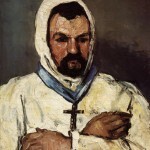 Cezanne was believed to not really have cared for people. 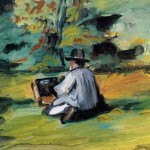 He much preferred being alone with the natural landscapes and objects that he painted. He was quite particular in his painting. He would pick up paint with his brush and often take 15 minutes just deciding on the perfect place to dab it. 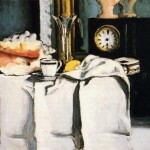 Human models were a trial for Cezanne because most simply could not sit still as long as it would take him to paint them. Fruit and flowers would wither and rot long before he would finish painting them so Cezanne took to using artificial replicas as his models. The artist seemed to have great difficulty transferring his visions to canvas and was known for his explosive temper both in his work and when with others. He was known to fly into great rages and viciously slash his own works to ribbons. Ambroise Vollard, a major art dealer of the time, related the story of how he came across one of Cezanne’s unfinished works hanging from a cherry tree. The artist had flung it there in frustration but later took it down and continued to work on it. It seemed destined for Cezanne to join the movement when one of his early teachers, Camille Pissarro was one of its founders. 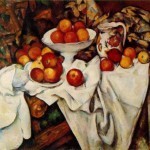 Cezanne, Pissarro, Manet, Degas, Renoir and Claude Monet believed paintings should reflect the painter’s interpretation of what they saw and not a perfect copy of the original. This Impressionist style was in conflict with what the French considered art in the 1860′s. Tradition called for painters to paint in a studio. These young upstarts painted the real world by being out in it. 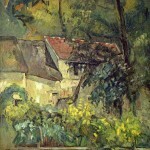 Cezanne grew more remote from his friends and told the few visitors he had about how little respect he had for Pissarro and Zola. He continued to paint nature while continuing to withdraw from society. He swore he would die with a paintbrush in his hand and that nearly came to pass. While painting, Cezanne got caught in a violent storm, fell and was exposed to the weather for hours. He died a week later on the 22nd of October in 1906.